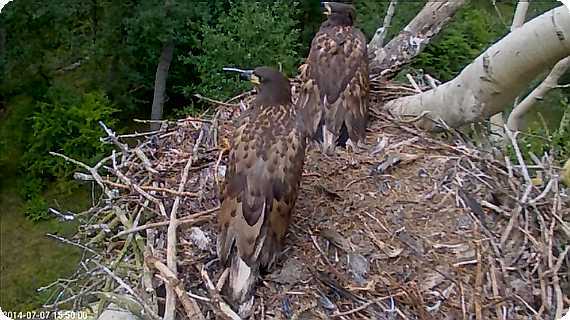 So seems both eaglets fledged. 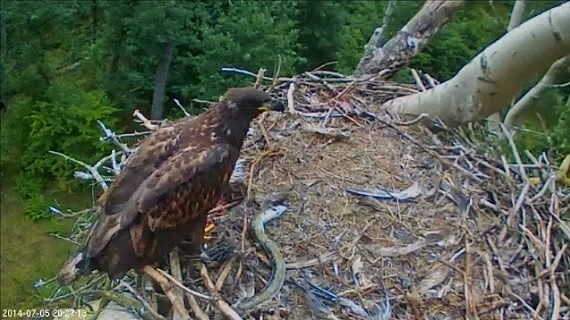 20:18 Parent brought an eel, but eaglet didn't ate it. 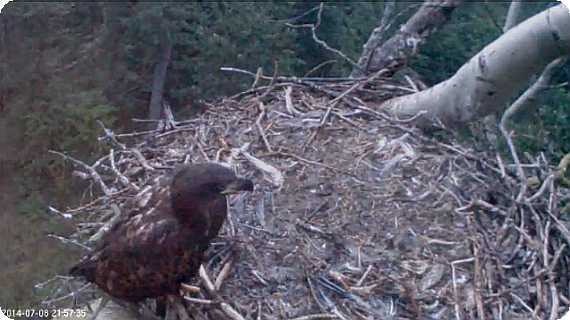 Did eaglet wait for sibling? 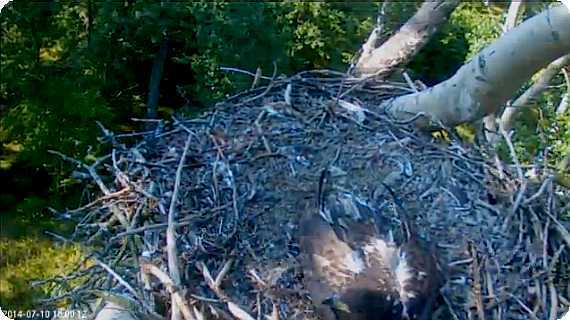 A parent eating on the nest and an eaglet whining somewhere near - for what this whining? 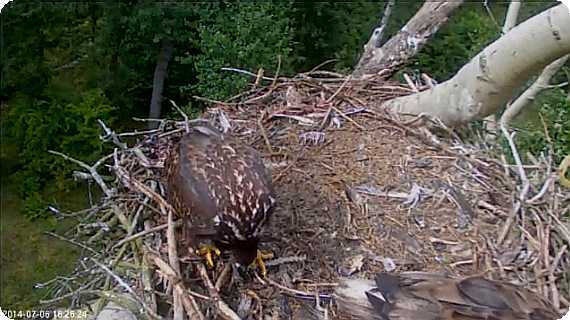 The eaglet flew down from the chicks' branch still whining and tried to get the prey from the parent - he/she found something but the parent continues with its prey. 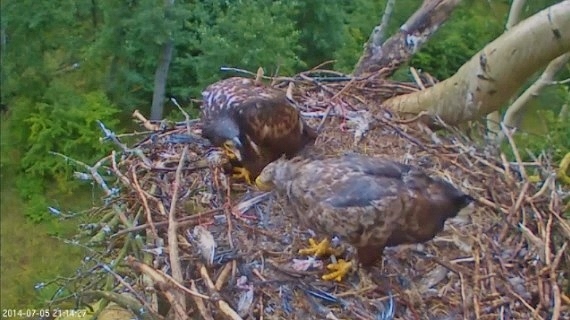 The parent even gives some morsels of food from beak to beak to the offspring! Whining goes on ... and stops when the parent takes off. 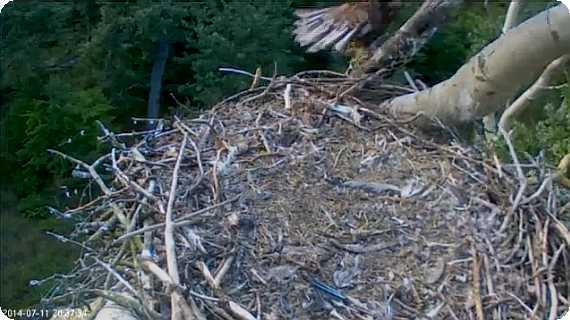 The eaglet flies onto the parents' branch. 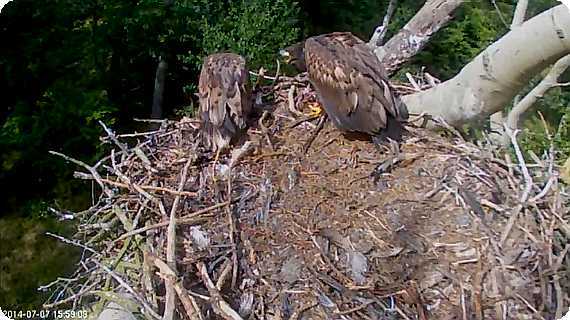 - I have a feeling that the eaglet that sits on the parents' branch is usually the girl eaglet - have you noticed the same or something else, Mamicja? 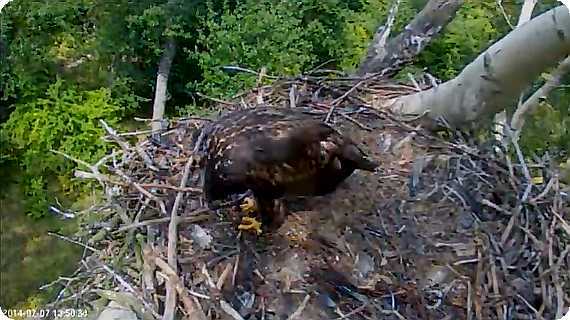 It seems that eaglet wasn't hungry, he was only jealous that parent was eating. They have become real troublemakers for the parents, they treat parents as intruders nowadays! 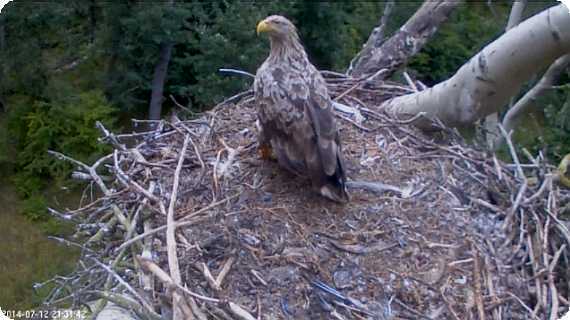 In the morning the nest was empty, but when I opened cam at 15:45 one eaglet (she?) was eating the fish while the second one was whimpered desperately. Finaly he took a backbone. Arriving parent had no chance to stay at the nest. 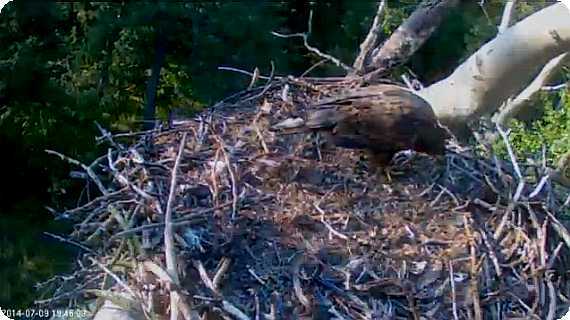 The girl eaglet flew out. 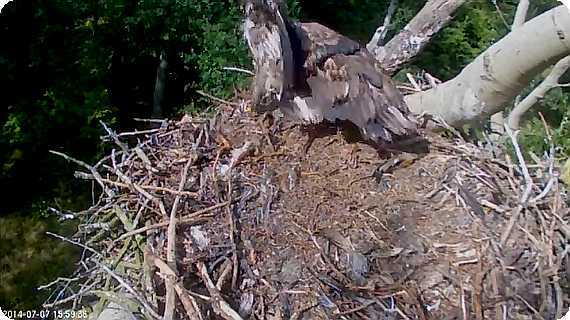 The boy eaglet flew off - it looked like to the parents' branch, but as after a while the girl eaglet seemed to go there, too, I don't know who went where. Both fly, that is for sure - no-one has wing damage! 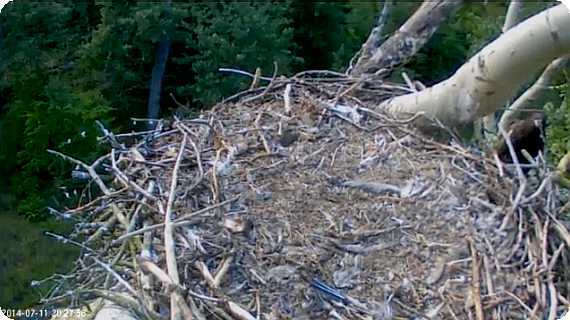 Till 19:21 the nest was empty. 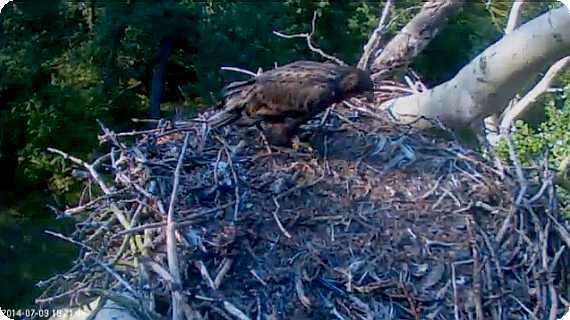 Then one of the eaglets flew in and now is eating leftovers. 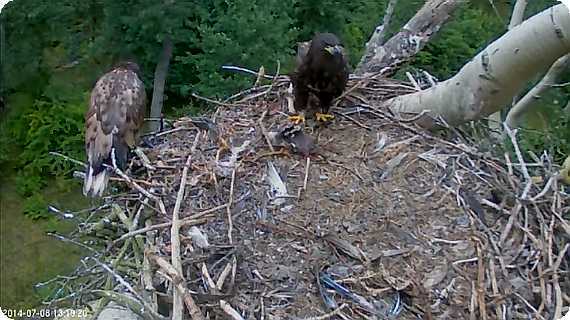 Today all day long eaglets were in the nest, one of them or both. I didn't notice any prey delivery. 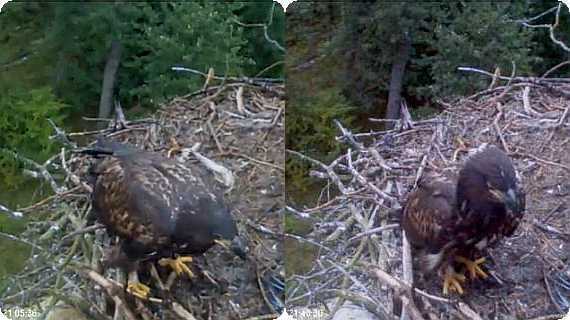 Today I noticed eaglets (one of them) in the morning and in the evening. 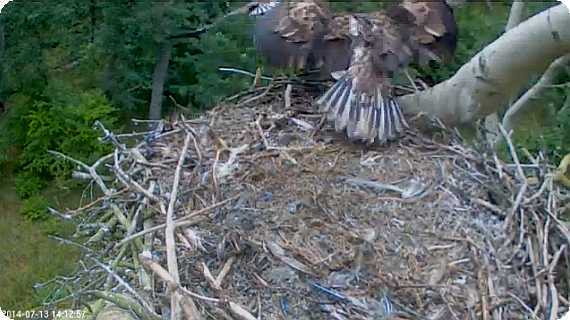 In the evening eaglet flew in at 20:24 (nice landing on the branch). He/she was looking for leftovers, visited parent's branch and finaly decided to stay in the nest for night. 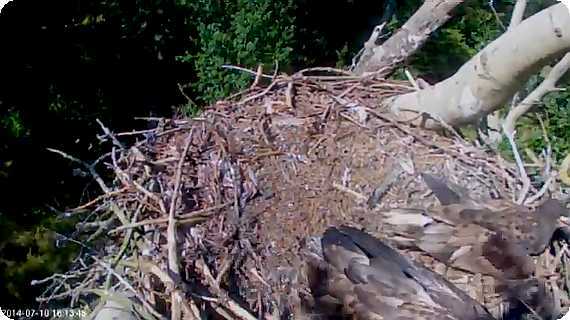 No eaglets today, only a woodpecker is pecking on the cam stand. 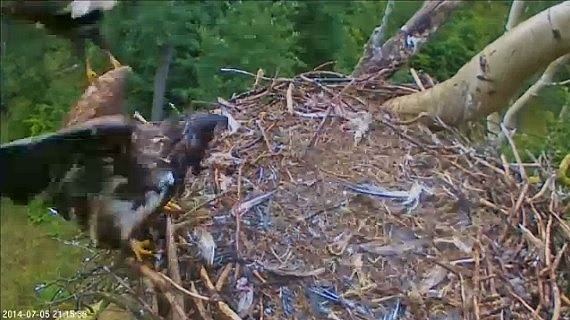 21:28 Mom flew in with a fish. 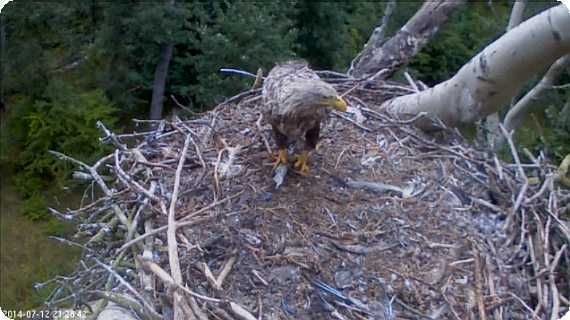 As no one eaglet arrived she ate a fish and flew away at 21:32. 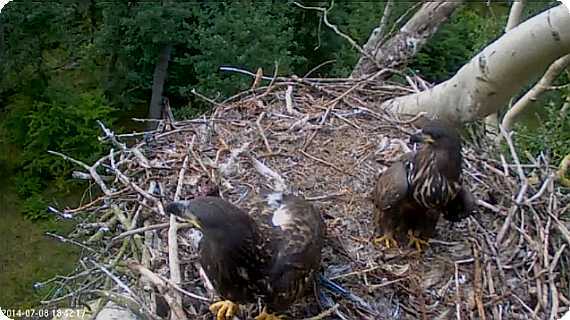 On the FB there is a comment of someone who has seen all the four eagles on the nest today. I haven't seen any of them, but have only had a look only now and then. Numerous arrivals and departures. 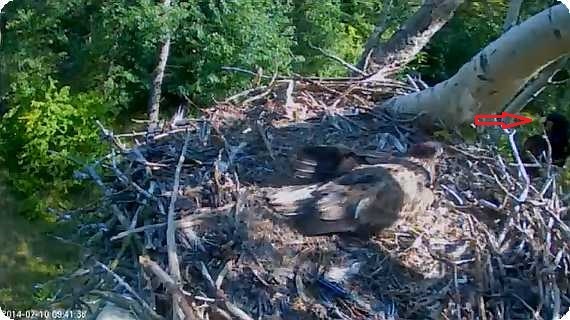 Even when eaglets are not visible one can hear their shrill begging squeals. 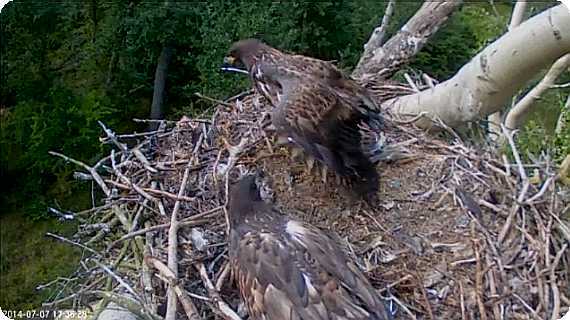 They don't stay in the nest at the same time, when one of them flies in, the second leaves. Now they are on the stage to improve flight abilities. 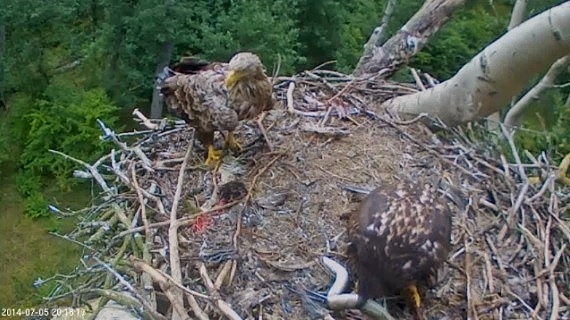 Next two-three months parents will learn them to hunt. They learn by watching parents. Parents will still take care of them, until they reach self-reliance (in autumn). 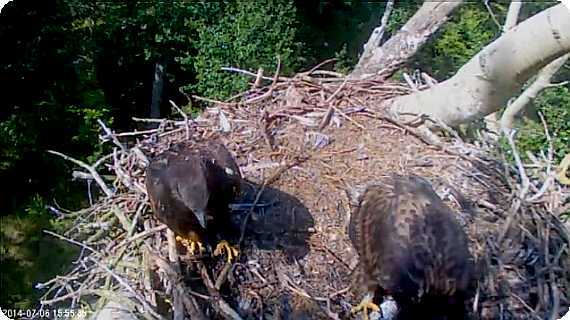 Before the next breeding season juvies are chased away from parent's territory. The eaglets development to independent eagles cannot be easy, as they already now treat their parents as intruders and threat! It would be nice to be "a fly on the ceiling" and witness all that learning - unfortunately the nest cams don't help us further in that purpose. 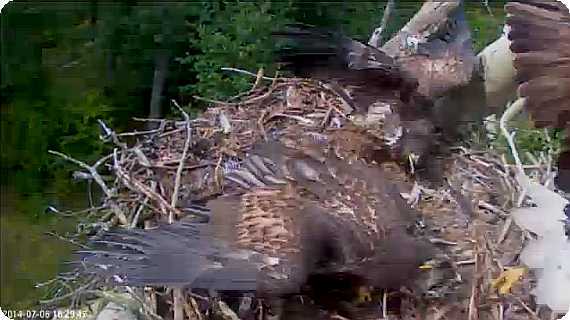 But the cams give us a lot even without that development! On FB they inform that the active following of the nest will become passive. All notices are still welcome. It is melancholic to separate from these bautiful birds - but obviously their learning will continue more and more outside the nest now. Thanks Mamicja for all your fine pictures and comments! Hope we meet on this thread next season again!